120 pages | 7 B/W Illus. There are many current socio-environmental conflicts and problems around the world that affect distinct nationalities, races, or ethnicities. Part of the solution to these issues involves interdisciplinary scholarship to make sense of the communication challenges that are involved. However, current research in this area has lacked clear focus on the ways in which environmental issues are culturally and socially constructed by racial and ethnic minorities. 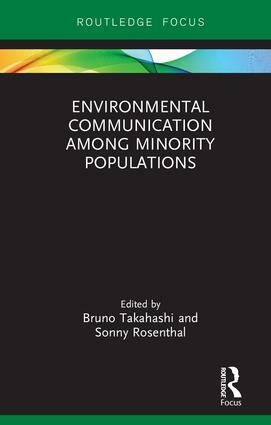 This volume aims to improve our understanding of culturally bounded rationalities across racial and ethnic groups facing environmental challenges, as they relate to the formation of environmental identities, environmental injustice, political activism, public engagement, and media representations, among others. The ideas presented in this book dovetail with the idea that environmental communication scholars and practitioners can effectively intervene to engage ethnic groups that traditionally are not included in decision making or deliberation processes that directly affect their livelihoods. Considering problems such as the siting of industrial facilities, flooding, droughts, climate change, and air and water pollution, this book will be of great interest to students, scholars, and practitioners of environmental communication. Bruno Takahashi is Research Director and Associate Professor at the Knight Center for Environmental Journalism, Michigan State University, USA. Sonny Rosenthal is Assistant Professor at the Wee Kim Wee School of Communication and Information, Nanyang Technological University, Singapore.